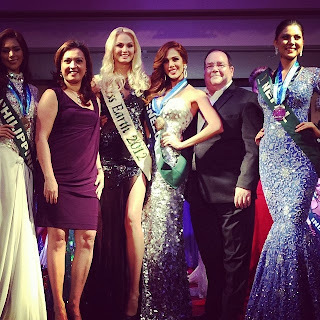 Miss Earth 2013 winners have been announced for the final evening gown competition held Thursday night, November 28, 2013, at the Grand Ballroom of Crimson Hotel Filinvest City in Manila. 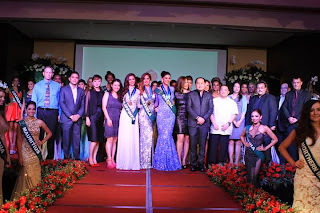 The candidate from Venezuela, Alyz Henrich, won the top honor (Gold Medal) while Miss Nepal Rojisha Shahi Thakuri and Miss Philippines Angelee delos Reyes came 2nd (Silver) and 3rd (Bronze) respectively. There are 89 candidates competing for the Miss Earth 2013 title, the highest number of delegation ever in the 13-year-old pageant. and Miss Philippines Angelee delos Reyes (2 Silvers, 2 Bronzes). The Miss Earth 2013 Finals or the Coronation Night will be held on December 7 at the Versailles Palace in Alabang, Muntinlupa City (same venue as last year). 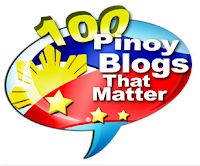 Telecast will be on the day after, Dec. 8, via ABS-CBN, but you can watch it live on StarWorld, Dec. 7, at 8PM.